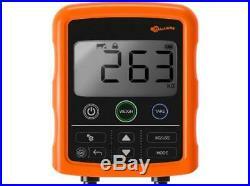 GALLAGHER W110 SCALE & LOADBARS. W110 Entry Level Weigh System. Ideal for 4H / FFA Projects. 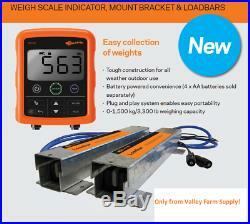 WEIGH SCALE INDICATOR, MOUNT BRACKET & LOADBARS – PLATFORM NOT INCLUDED. Easy collection of weights. Tough construction for all weather outdoor use. Plug and play system enables easy portability. 0-3300 lb weighing capacity. Easy to use modern design with large intuitive touch buttons. 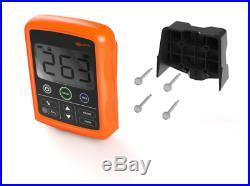 Flexible weighing options – three modes for weighing general purpose and livestock. Robust – heavy duty, waterproof loadbar connectors. Fits most platform sizes with top-mounting holes. 23 Long galvanized steel chassis construction for long life. Durable – protected 177 cables to minimize damage when weighing. Platform not included – Easy to set up a platform for your animals such as a crate. Gallagher platforms are available from us. 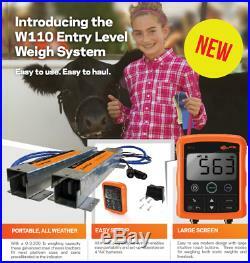 There are few things you can count on when raising or showing livestock, but you can count on Gallaghers easy W110 Livestock Weighing System. 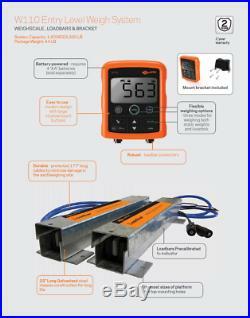 This easy to use portable entry level system comes with a weigh scale indicator, mount bracket, loadbars and connection cables. Why should you weigh your livestock? Today, leading producers recognize that livestock weighing is an essential component of effective farm and ranch management. Capable and reliable, and yet so simple to use – Gallagher SmartScale provides a weighing solution that contributes to more profitability and takes the hassle out of livestock management. The regular weighing of live animals is vital to increased productivity and profitability. Well-informed management decisions come from animal weight data that is easily obtained and accurate. The Gallagher SmartScale range of superior single-animal scales allow producers to. Measure feed conversion by monitoring weight gain over time to maximize yield Well-informed management decisions are made for feed rationing to meet target weights by date. Information gained from the fast, accurate capture of body weight measurements from the SmartScale provides for more efficient use of time and resources on the farm and ranch. Monitor animal health Accurate measurement of body weight gives critical information about the health of the animal. Changes in body weight can provide an early indication of animal health problems. Confirm animal weights prior to breeding The live weight and condition of the animal can have significant impact on the breeding performance. Determine weaning weights The future performance of the animal can be directly linked to the weight and maturity of the animal at the time of weaning. Evaluate breeding performance for genetic selection Accurately tracking growth rates of progeny over time provides vital information for genetic selection and improvements in breeding performance. Maximize the benefits of having animals fitted with Electronic Ear Tags A direct interface between Electronic Ear Tag readers and the SmartScale range of weighscales provides a significant opportunity to improve farm and ranch management practice. Error free identification of animals prevents incomplete or inaccurate records of animal number and weight information. Automatic ear tag scanning and hands free weighing of animals reduces labor requirements at the weighing site. 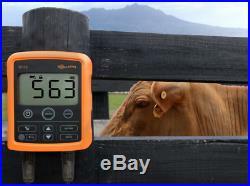 The item “Gallagher W110 Entry Level Cattle Livestock Scale Package Free Shipping” is in sale since Saturday, January 26, 2019. 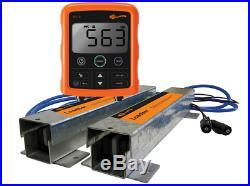 This item is in the category “Business & Industrial\Agriculture & Forestry\Livestock Supplies\Beef Cattle”. The seller is “valleyfarmsupplysales” and is located in New Providence, Pennsylvania. This item can be shipped worldwide.